Like all oily fish, smoked mackerel is high in omega-3 fatty acids, which are important for a healthy heart. Omit the crème fraîche if you want to make this dairy free. 1. Preheat the oven to 220ºC, gas mark 7. Cook the rice according to pack instructions, then drain and set aside to cool. Toss the tomatoes and oil in a small roasting tray, season and cook for 15 minutes. When they come out of the oven, squash with the back of a fork and stir in the crème fraîche; set aside. juice in a small bowl; season and set aside. Once the rice has cooled, lightly toss with the onion, rocket, avocado, cucumber and most of the basil; season. 3. 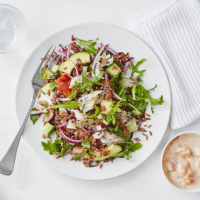 Divide the rice between plates, spoon over ½ of the tomato dressing, top with the flaked mackerel (discard the skin), then finish with a drizzle more dressing and the remaining basil. This recipe was first published in Wed Dec 30 14:31:52 GMT 2015.